Most mornings, Dr. Amber Wobbekind was already running behind before the coffee had finished brewing at Denver Health. She and the other primary care doctors, faced with a full slate of patients, scheduled 12 appointments per half day starting at 8 a.m. To have even a fighting chance at making the appointment math work, they could afford to spend about 15 minutes with each patient, including time to fill out charts and paperwork. Wobbekind, a big believer in getting to know her patients, routinely spent 30 to 40 minutes in each visit, not including charts and paperwork. She brought home an additional three to four hours of that work each night. “In the primary care system the way it is, that’s not functional,” she said. “You can’t be a person who does that.” Her supervisors offered to provide her with efficiency training. Realizing the traditional primary care model was not working for her, Wobbekind began exploring other options. Everywhere she looked, however, she found the same type of model: Too many patients, not enough time. After listening to a podcast by two Direct Primary Care doctors from Wichita, Kansas, she was sold. open The Golden Stethoscope in Golden. “As soon as I heard that I thought, ‘This is it. This is how it’s going to work for me as a doctor,’ ” she said. 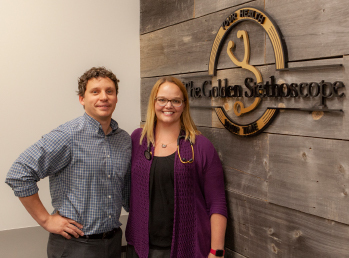 Wobbekind, a Colorado native, opened her Golden Stethoscope clinic in Golden last May. Owning her own practice gives her the freedom to provide health care and spend time getting to know her patients, she says. Monthly membership at The Golden Stethoscope costs between $90 and $115 a month, depending on age. Patients receive up to 20 visits per year. There are no copays, and patients are told about any additional costs up-front. “Anything I can do with my brain and my two hands and the equipment in the office is part of it,” Wobbekind said. 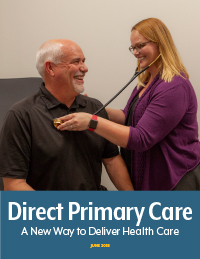 The absence of tight time constraints allows Wobbekind, an internal medicine doctor, to spend time doing more things she is trained to do but never had the time to do in a traditional primary care facility. And more importantly, the clock does not start ticking the moment Wobbekind enters the exam room. She brings a laptop along, but doesn’t open it unless necessary. “I don’t want the computer to be what I’m talking to,” she said. Appointments at the Golden Stethoscope are scheduled for an hour. Most patients don’t need that much time, but having it available eliminates the feeling of being rushed through the doctor’s office. Wobbekind treats about 100 patients now, but her goal is 700 patients. With that growth, she envisions adding more providers, including another doctor, a physician’s assistant, a behavioral health specialist and an acupuncturist. Each would maintain their own group of patients to ensure strong relationships. “There are liabilities and pieces to figure out, but the plan is it will be a very integrated environment for patients to take advantage of all those things,” she said. For now, Wobbekind enjoys operating a practice, “where both your health and your time are golden,” as it states on her business cards.